Eleanor of England was born in 1215 at Gloucester, Gloucestershire, EnglandG.2 She was the daughter of John I 'Lackland', King of England and Isabella d'Angoulême. 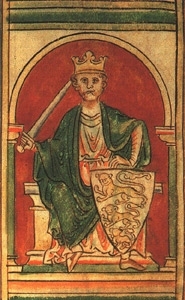 She married William Marshal, 2nd Earl of Pembroke, son of William Marshal, 1st Earl of Pembroke and Isabella de Clare, Countess of Pembroke, on 23 April 1224.2 She married Simon de Montfort, 6th Earl of Leicester, son of Simon de Montfort, 5th Earl of Leicester and Alice de Montmorency, on 7 January 1238.2 She died on 13 April 1275 at Montargis Abbey, Montargis, Orléanais, FranceG.2 She was buried at Montargis Abbey, Montargis, Orléanais, FranceG.2 She was buried at New Temple Church, London, EnglandG. [S11] Alison Weir, Britain's Royal Families: The Complete Genealogy (London, U.K.: The Bodley Head, 1999), page 56. Hereinafter cited as Britain's Royal Families. She was also known as Maud of England.